Kirill Slepets and Chekhovich scored within a minute of each other just beyond the midway point of the third to put Russia up 5-1 and that’s the way things would stay as Russia climbed into a 9-6 series lead in points headed into Thursday’s series finale in Drummondville. Big @QMJHL contributions to the @russiahockey_en 🇷🇺 cause in Game 5. 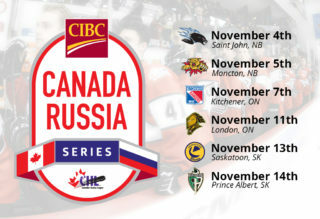 Russia skates to a 5-1 win in Sherbrooke to take a 9-6 @CIBC #CANvsRUS lead in points. For the second straight year, Game 6 will decide the series. The puck drops on Thursday night at Centre Marcel Dionne in Drummondville, QC as five Voltigeurs look to bring Team QMJHL back from the brink when the puck drops at 7 ET/4 PT on Sportsnet and TVA Sports.